Would Like Your Home To Be Permeated With The Sounds & Smells Of A Fried Chicken Fast Food Restaurant? Of course you do! Otherwise, you wouldn’t have read past the headline! KFC has been venturing into the ‘home goods’ market a few times over the past couple years. 2018 saw the launch of the fire logs that gave off the scent of fried chicken seasoned with the Col.’s famous eleven herbs and spices. 2017 saw the release of the Col.’s scented bath bombs for those that wanted to enjoy a soak in the sweet smell of fried chicken grease. 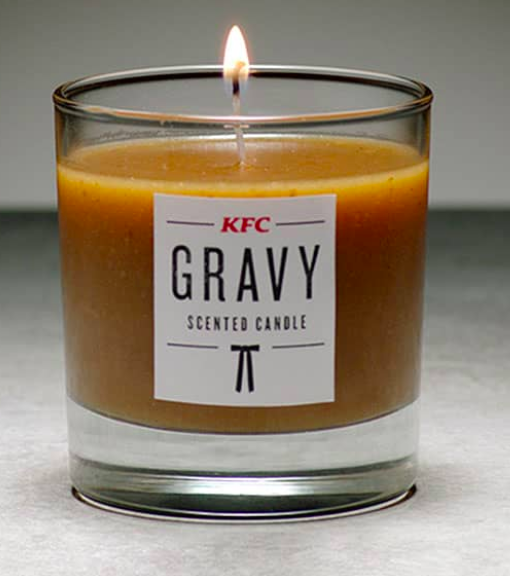 2019’s offering almost seems reserved comparatively: The KFC gravy scented candle! Another difference between the candle and previous products is that the candle is an extremely limited edition offering (only 230 units which seemed like an odd number to me) and can only be won in their sweepstakes. No option for purchase! Along with the new candles, the fast food chain also launched their new ‘KFChill’ experience, which is a site dedicated to help fans of the restaurant find their zen with sounds from the KFC Gravy Mega Box. And it’s AWESOME!!! Where else can you relax to the sound of frying chicken? Unwind to the sound of falling fries? Or de-stress to the sound of simmering gravy? Enter to win one of the candles here! I did! Who Doesn’t Want A KFC Lego Set!?! My husband works at Bojangles. I get to smell this kind of scent daily LOL! Very insteresting candle scent! Love it! Love gravy and candles! Never thought there would be a gravy scented candle before. Wow! This would make a great white elephant gift! Haha!! What a brilliant idea! Food scented candles to make your home delicious. I think this is so funny, I have to get this for my friend that is obsessed with KFC. This has to be the strangest scent for a candle ever, but it’s also pretty funny. I give KFC props for always coming up with these unique trinkets. This has got to be one of the funniest post I have ever read! Great work Geeky Dad! Subscribed for more ….